In the capitals of two staunch allies last week, top intelligence officials spoke about the nuclear threat from Tehran. Differences were clear. Both men were reacting to, and interpreting, the United Nations’ confirmation last month that Iran after a quarter-century of effort had collected enough atomic material, in dilute form, to produce a bomb. Israel and the United States have worried for years about what they would do at such a moment. Now that it has arrived, the passing of the milestone has forced into the open longstanding differences between the two allies about how urgently to treat the threat. As Admiral Blair implied, the nuclear-threat clock ticks a lot faster in Jerusalem than in Washington. Where this new dynamic leads is unclear. But the Israelis have seized on the Iranian milestone to redouble pressure on the United States for a tougher stance against Iran, and to remind the new president that their patience has a limit. In fact, Israeli officials have quietly been delivering the message that the diplomacy Mr. Obama wants to start with Iran should begin promptly — and be over quickly. “By late spring or early summer,” one senior Israeli intelligence official said the other day, echoing a message delivered in Israel to Secretary of State Hillary Clinton. Otherwise, they argue, the Iranians will drag talks on endlessly while speeding ahead on bomb work. The Obama team, by contrast, is taking its time to craft a new diplomatic approach to Tehran, putting the veteran Middle East diplomat Dennis Ross at the head of a team to set up what Mr. Obama last year called a strategy of “bigger carrots and bigger sticks.” Real discussions may not begin until after Iran’s elections in June. 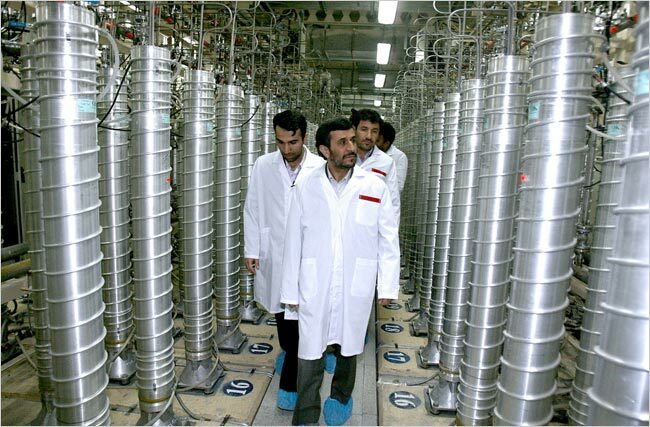 Iran’s president, Mahmoud Ahmadinejad, at Natanz. Today Iran tested a new long range ballistic missile. Israel sees Iran as an existential threat armed with such missiles and nuclear weapons. A right wing government headed by Benjamin Netanyahu is being formed in Israel and Netanyahu has made noise about attacking Iran in the past. And all of this includes Russia. Since President Obama’s inauguration, Russia has been testing Mr. Obama and his administration rigorously and continuously. Russia has been jerking around all of Europe, showing who is boss of the gas and winter heating fuel for NATO which inludes the U.S.
Russia has even managed to withstand a threatened NATO boycott of ties as a direct result of Russia’s invasion of Georgia and South Ossetia last summer. Today NATO members scrapped their threatened cut off of Russian ties just as Russia threatened to again stop the flow of Russian oil to Europe. And the New York Times and other media reported that President Obama sent Russian President Medvedev a letter which may have offered to scrap U.S. missile defense plans in Europe in exchange, some believe, for Russian help in stopping Iran’s nuclear program. America’s missile defense effort in Europe was planned to stop Iran’s long range ballistic missiles: which were demonstrated as real and advancing again today. Russian leaders are certain to be gloating at the pliability of the Obama Administration and the West since Obama became president. Despite Joe Biden’s warning last October, the international “testing” of Obama is ongoing — just not as obviously and publically as Russia tested JFK during the Cuban missile crisis. It seems that Russian leaders may have matured and become more subtle since the 1960s. U.S. leaders have not…. So, even before America’s economic problems are solved, even before the stock market has started to recover, even before the stimulus has worked any magic, and even without a real start of revolutionizing health care and turing our thirst for oil into a love of wind: the Biden predicted testing is ongoing. Russia: Medvedev Pushing Putin Out? NYT Editorial: Russia only understands strength…. Two of Israel‘s top defense officials say Hamas has been badly hurt by Israel’s Gaza offensive but that the group will fight on. Military intelligence chief Amos Yadlin told the Israeli Cabinet Sunday that the group’s ability to fight has been damaged by the devastating assault Israel launched Dec. 27. He says Hamas is suffering from ammunition shortages and has been hard hit by the deaths of senior militants. The officials’ comments Sunday were relayed to the press by Israel’s Cabinet secretary. You are currently browsing the archives for the Amos Yadlin category.